Even government shutdowns can’t put a damper on the consumer’s plot to shop this holiday season. In fact, the National Retail Federation forecast sales in November and December to increase 3.9 percent from 2012 to $602.1 billion – higher than the 10-year average holiday sales growth of 3.3 percent. “Overall, retailers are optimistic for the 2013 holiday season, hoping political debates over government spending and the debt ceiling do not erase any economic progress we’ve already made,” said NRF President and CEO Matthew Shay in an October report. This year’s holiday retail season shows trends already emerging – like when people will shop, what products they’re interested in and what devices they’re using to shop with. The term “Black Friday 2013” is spiking by 1,013 percent this month. The term “Cyber Monday 2013” increased by 735 percent just this past week. Searches for “Black Friday ads” jumped by 351 percent this month. And certain areas of the United States showed more interest in Black Friday than others. “Most U.S. searches for ‘Black Friday’ this month have originated in Omaha, Minneapolis, Los Angeles, Columbus, and Buffalo,” Yahoo said. While Black Friday is generating interest, Adobe predicts that 2013’s Cyber Monday will be the “biggest online shopping day ever” generating an estimated $2.3 million. ComScore predictions are aligned with this. “We also expect that Cyber Monday will once again rank as the top online spending day of the year, as it has been for the past three years,” it said in a report. And because there are fewer shopping days between Thanksgiving and Christmas this year, it could mean different shopping patterns than years prior. Adobe predicts Thanksgiving Day will emerge as the fastest-growing sales day. “Thanksgiving will actually be the fastest growing online sales day of the season (up 21 percent over last year) and much of that will be driven by mobile shopping done under the turkey table or while supposedly watching a football game,” Adobe said in its report. Experian Marketing Services has been tracking trending product searches through data from Hitwise, showing what’s on people’s wish lists as the holiday season approaches. For tech junkies, it seems Apple-related products are at the top of many people’s list, with the iPad Air stealing the No. 1 spot. Furbies are making a comeback according to data from Yahoo which shows “furby boom” is trending this holiday season with a 194-percent increase in search volume. Outside of toys and tech, the other hot-ticket items, according to Experian and Yahoo include apparel – boots to be exact. Experian shows Uggs as the No. 1 searched-for item in week ending November 9. Armed with the knowledge of what people are searching for, retailers need to know next how people are shopping to cater the experience. Adobe forecast mobile shopping will rise 40 percent this holiday season, according to data from the Adobe Index. In fact, Adobe predicts the best websites will see nearly 15 percent of sales coming from tablets and 6 percent from smartphones. “M-commerce has reached a record high percentage of total online spending in three of the last fourth quarters of the fiscal year. We expect this trend to continue into 2013, surpassing the 11.3 percent of total digital commerce spending achieved in Q4 of 2012,” comScore said in a report. But when it comes to buying all those toys on the most-wanted list, mobile shoppers and Furby enthusiasts will likely have a good experience at Toys “R” Us, which came in second out of the 100 top retail sites examined for mobile. Apple, however, isn’t prepared. Coming in dead last out of 100, Apple’s mobile experience is lackluster when measured against factors in The Search Agency’s scorecard – even as a leading tech company and producer of this holiday season’s most-wanted products. 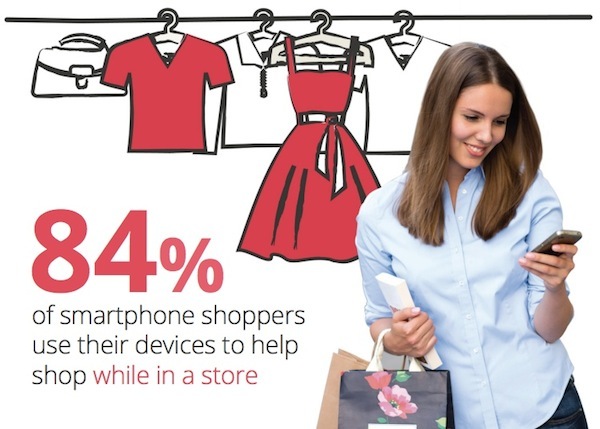 More than just catering to a mobile device, retailers need be prepared for how mobile shoppers use devices while in the store. An emerging trend amongst mobile device users is “showrooming” – checking out products in store, only to buy online at a later time. Google reported earlier this year another trend in mobile shopping; 84 percent of smartphone shoppers surveyed said they used their device to make purchase decisions while in the store. Adobe reported retailers like Macy’s and Target are prepared for the new ways mobile users are shopping by offering special apps that will help shoppers navigate Black Friday deals while in the store this year. So when it comes to what your consumers are looking for this holiday season, what device they’re using and where they’re using it, the question is: Are you ready for the biggest retail season of the year?